The Gough Restoration Programme aims to eradicate the invasive mice on Gough Island that are predating albatross and other wild bird chicks. The RSPB and Tristan Government are undertaking an ambitious programme of conservation action to restore Gough Island by eradicating the invasive non-native mice that are killing the island's unique seabirds. There have already been a number of exciting developments this year in the project to eradicate invasive mice from Gough, including the launch of two web resources. Firstly, on this website, we have added a new section for the programme at: www.tristandc.com/wildlife/goughrestoration.php, which will bring together all the news and announcements from the project as we work towards the eradication. 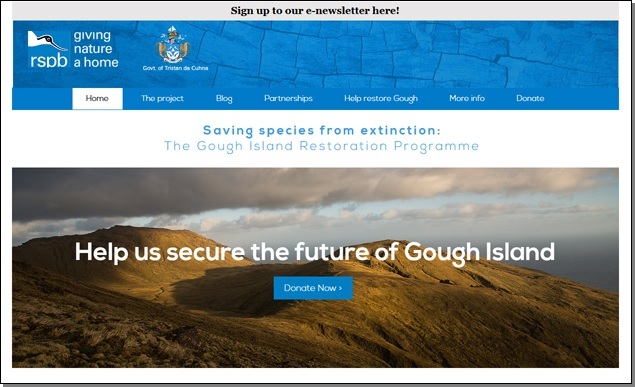 Additionally, the RSPB has launched its Gough Island website: www.goughisland.com. This includes photographs of Gough Island birdlife, and blogs from the Overwintering Teams spending a year on the island. The RSPB site also has links to project documents, and an option to sign up for the e-newsletter 'Island Restoration News'. The latest newsletters can be downloaded from: www.goughisland.com/more-information. Coming soon will be an introduction to the RSPB’s new Gough Island team that is driving the project forwards. Tristan da Cunha has been working closely with the RSPB on plans to restore Gough Island by eradicating the invasive non-native mice. This is an incredibly complex operation, and with the ultimate goal of saving species firmly in our minds, the RSPB, with support from Tristan da Cunha Government, have made the difficult decision to delay the operation until 2020. We did not make this decision easily. It is important to note that the commitment and partnership of the RSPB and Tristan da Cunha Government to eradicating the mice and saving the Tristan albatross, Gough bunting and other endangered species remains as strong as ever. A successful operation would stop the ongoing population declines in its tracks. However, the complexity of the operation cannot be underestimated. This additional year of preparation is an opportunity to ensure our planning will deliver the best possible outcomes for Gough and its wildlife. The opportunity to eradicate the mice is fixed to between June and August each year, if we delay, we must delay by a minimum of 12 months. June 2020 is then the soonest feasible date that we can carry out the operation. 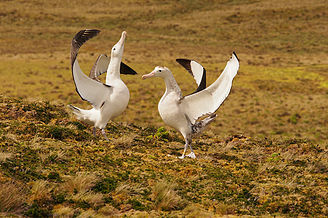 Right: A pair of Tristan Albatross taking part in their courting display. The mice eradication project is designed to protect species like the Tristan Albatross. How will we maximise use of this additional year? This is one of the most important elements of the operation, and with birds as our focus, we will use this additional time to perfect the design, materials, and approach to the birds care. To safeguard two of the islands endemic species (the Gough bunting and Gough moorhen) during the operation we will house a proportion of them in temporary aviaries on Gough. Once the operation is complete and possible risks passed, the re-released individuals will re-join the wild population, ready to thrive on the mouse-free island. The aviaries will be purpose built for each species and the conditions on Gough, based on a trial by this year's Gough 63 team and guidance from expert aviculturalists. Kate Lawrence's photo shows the unique and beautiful Gough Island. Together with Inaccessible Island it forms a special World Heritage Site. In the last six months, we have welcomed staff with invaluable experience to the Gough Island team. They bring knowledge and expertise from island restorations including the successful Desecheo and South Georgia projects. It is the skills and experience of our team that will ensure our plans are robust and that no stone is left unturned, and we will spend the next two years utilising that knowledge for the benefit of Gough’s species. Again, this all plays its part in ensuring a successful operation. Our commitment to restoring Gough Island and preventing the extinction of Goughs species alongside Tristan da Cunha remains firm. From the outset, we committed to delivering a plan that would maximise the probability of success, and we believe delaying by a year will do just that. Tristan Administration (tdcenquiries@tdc-gov.com) or RSPB (Laura.Beasley@rspb.org.uk). RSPB representatives will also be visiting Tristan in September during the annual changeover of the Gough Island team, and would be happy to talk in more detail about the decision then. All going to plan, today marks one year until the Agulhas II leaves Cape Town for Gough Island on 15th May 2019 to start the mice eradication operation to protect endangered land and sea birds. Kate Lawrence's photo shows the unique and beautiful Gough Island; the fern bush habitat on the lower slopes is home to Atlantic yellow-nosed albatrosses. Gough Island, in the middle of the South Atlantic, needs our urgent help. 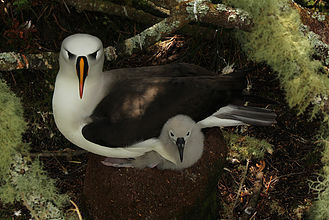 Every year over one million seabird chicks are killed, pushing some species towards extinction. The chicks are killed by an invasive non-native species of house mouse that was introduced to Gough by humans. The RSPB and Tristan da Cunha Government have developed an ambitious programme of conservation action. 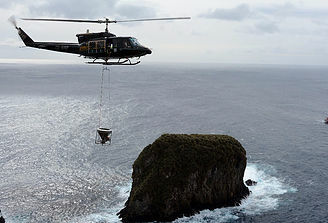 In 2019 rodenticide bait will be spread across Gough Island, eradicating the mice and restoring Gough to its natural state. This action will prevent the deaths of defenceless chicks year after year, halting decline and allowing populations to bounce back. To support Tristan da Cunha Island Council as custodians of Gough Island and ensure a lasting legacy for Tristan da Cunha, a British Overseas Territory. The solution is relatively straightforward, though the operation is logistically complex, mainly because of the island's remoteness, tough terrain, and harsh weather conditions. Using helicopters, highly experienced pilots will spread cereal bait pellets containing a small amount of proven rodenticide across the island. In difficult to reach areas bait will be spread by hand to ensure that every mouse encounters rodenticide pellets. We are well-placed to carry out such an important and complex operation. The RSPB and our partners have years of island eradication experience to draw on. The programme also involves some of the world’s leading experts in the field of rodent eradications who have been buoyed by the success of the Macquarie Island Pest Eradication Project and the successful delivery of the South Georgia Habitat Restoration Project. Both of these projects highlight that complex island restoration projects are achievable in difficult environments. The operation is on track to go ahead in the Southern winter of 2019 (May-August). Below right: Pair of Tristan Albatross taking part in their courting display. Both these species of albotross are presently attacked and killed by mice. www.goughisland.com. Please share it with anyone you think would be interested. and share, like, retweet etc to help us build the support!